He can't drain the swamp when they are in his cabinet. Out of 24 Cabinet or cabinet-level positions, 8 are swamp inhabitants. That is pretty good. I did not count Ryan Zinke (Interior) and David Shulkin (VA) because they were not in DC long enough. Yes, it is an arbitrary cutoff. Always an excuse when Trump compromises. When politicians (who, by definition, compromise) do it, it's a character flaw! Rubio and Kasich could teach Trump a lot about conviction, but I know you're just trying to goad me. What they would've done is of no consequence now...let's evaluate the "leadership" of the deal maker. Unimpressive if you're honest...and I know you are. Get ready...this is where we're headed. The conservatives are the problem...cut the deal! FWIW, I don't approve of Trump getting in bed with Ryan on this thing. Did you notice how many of these congressmen didn't take a stand before the vote count? Then after, they jump on the train like they were for it all along. I'm very disappointed in my congressman for doing that. I guarantee that 75% of his voting base expect him to vote hard line conservative. Well, the blame is really at the feet of Paul Ryan, no doubt. He needs to be replaced. I do believe the freedom caucus got the provision removed that set requirements for what the insurance policy MUST cover. They wanted the provision removed that covers pre-existing conditions, and that may have gotten them reelected in their districts, but it would have sunk the GOP for years to come. With the makeup of the republican party and with Ryan as the speaker, this bill may have been as good as it's going to get. Yes, the bill sucked, but not as bad as Obamacare. It was a small step in the right direction, and I fear the dems are going to run this show if Trump tries again (because Trump is not a conservative). Trump will work with those that offer him the best possiblility of success (but NOT RUSSIA, for anyone wanting to go there). In many respects, Trump is pretty much like Bill Clinton. Actually the freedom caucus wanted real insurance. Any "insurance policy" with mandates of pre-ex conditions is not insurance. As we both know it was set up as a government entitlement just like Obamacare. There is no way to exclude the pre-existing condition requirement from future regulations unless someone wants to commit political suicide. So what are the options? Congress is way over paid to figure this out. I was simply pointing out that when pre-ex is removed it is no longer insurance. Our people have also been indoctrinated to believe that the "must buy" mandate needs to be included. ​So many places this article could go. WASHINGTON – The formula for a de facto coup against President Trump is pretty simple and it’s happening before our very eyes, according to one of the nation’s top scholars and most esteemed political analysts. And evidence for that theory is backed up by equally renowned political observers. 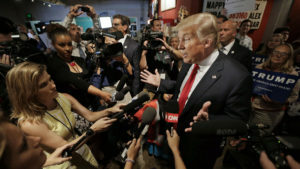 The mainstream media pumps out anti-Trump stories to undermine the president. Removing the support of the “purple” GOP lawmakers gives Democrats a de facto majority to stop the Trump agenda, even though Republicans have majorities in both the House and the Senate. Speaking with Tucker Carlson on Fox News on Thursday, Hanson described how it began with the creation of a narrative of a failing presidency. “What were seeing here, I don’t want to be too dramatic, it’s sort of, historically, a slow-motion coup where you have a nexus of celebrities, academics, the Democratic and progressive parties, and then you have the media, and they feel they can delegitimize a president with a thousand nicks, none of them significant in themselves, but they coalesced to build a narrative that Trump is inexperienced, that he is uncouth, that he’s crude, that is reckless,” explained the scholar. Those small wounds take a collective toll, paralyzing the administration and the government by disabling the Republican majority. Hanson described how the mainstream media doesn’t need to find any actual or provable wrongdoing by the administration to keep the Democrats’ anti-Trump agenda in the headlines and hobble the president. 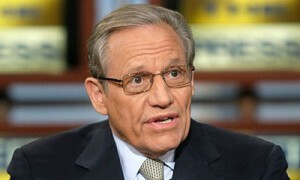 Perhaps Woodward has been sobered recently by the sensational anti-Trump stories coming from his own newspaper that have turned out to be not true. On May 10, the Post reported that FBI Director James Comey had requested more resources for the Russia investigation shortly before he was fired by the president. lol. Russia is scary. If they were a state, they'd have the 4th largest GDP in the US! How do you send Don Jr to the calusadoption meeting? You know he's gonna screw it up. Come on Manafort!